On this page you will find updates on Tropical Depression Agaton based on the weather forecast of PAGASA on Friday, January 17, 2014. Earlier, the state weather bureau reported that the Low Pressure Area southeast of Guiuan, Eastern Samar developed into a Tropical Depression and was named Agaton. As of 4pm, Bagyong Agaton was spotted at 165 kilometers Northeast of Hinatuan, Surigao del Sur or 190 km East of Surigao City with maximum sustained winds of 55 kilometers per hour near the center. It is forecast to move Southwest at 5 kph. 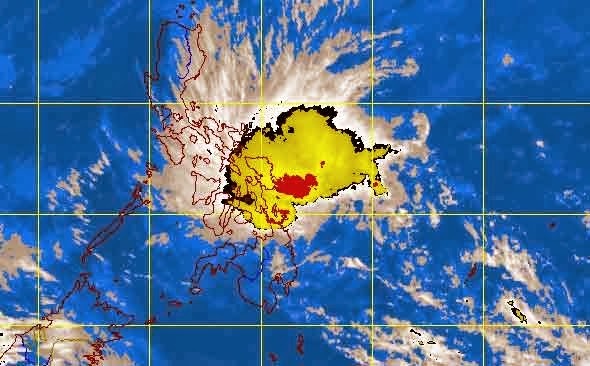 State forecasters said the estimated rainfall amount is from 5 to 15 millimeters per hour (moderate to heavy) within the 300 km diameter of Tropical Depression Agaton. It will bring moderate to occasionally heavy rains and thunderstorms over Eastern and Central Visayas. Sea travel is risky over the seaboards of Luzon, Visayas and Caraga Region, PAGASA added.